BOSCH Security Systems has introduced a high-end smart surveillance camera series that delivers the most natural picture performance for a camera in its class. Called the DinionXF, this camera series uses 15-bit digital processing technology to capture the full dynamic range of any scene in a single image. All the details of the image are captured regardless of the lighting conditions. With many innovative features, the compact camera is suitable for security-oriented applications. The DinionXF series is highly sensitive in any environment. It features advanced techniques such as SensUp and dynamic noise reduction to ensure first-class picture quality under low light conditions. The Nightsense feature extends the camera's use to even lower light levels. Day/Night switching models give IR sensitivity at night, while the black/white models feature superb sensitivity for visible light and IR radiation. The DinionXF series also includes backlight compensation, wide ATW range, unmatched colour fidelity and a default shutter mode to give the camera an edge in picture quality. All DinionXF cameras feature an advanced video motion detection system that generates an alert signal when movement is detected. Up to four individual areas - each with its own detection threshold - can be programmed to ensure a high probability of detection, and false alarms are minimised. When combined with Bosch digital recording systems, the DinionXF is perfect for high-security surveillance applications. 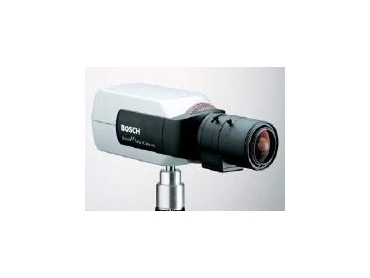 Bosch designed DinionXF to be one of the easiest cameras to install, configure and operate. Three independent modes are pre-programmed. The camera operates perfectly out of the box. Auto-lens detection and the Lens Wizard ensure that the lens set-up and focusing is correct first time. Tuning the performance is achieved via the built-in controls and on-screen menus, or using the configuration tool. The camera can also be operated and fine-tuned over the coax when connected to a PC and using the Bilinx interface. New firmware enhancements can be uploaded in the same way. DinionXF's built-in cable compensation enables cable lengths of up to 1km to be used without the need for costly video amplifiers. DinionXF is one of the most complete cameras in the marketplace. Its stylish yet unobtrusive housing offers discrete, reliable surveillance in all weather and lighting conditions. DinionXF is the first camera series to introduce 15-bit video processing to the security market, and provides the best picture performance for a camera in this class.